This 4 Output Distribution Amplifier splitter accepts Audio & S-Video signals and broadcasts them to multiple output devices (TV, monitor, home theater system, projector). 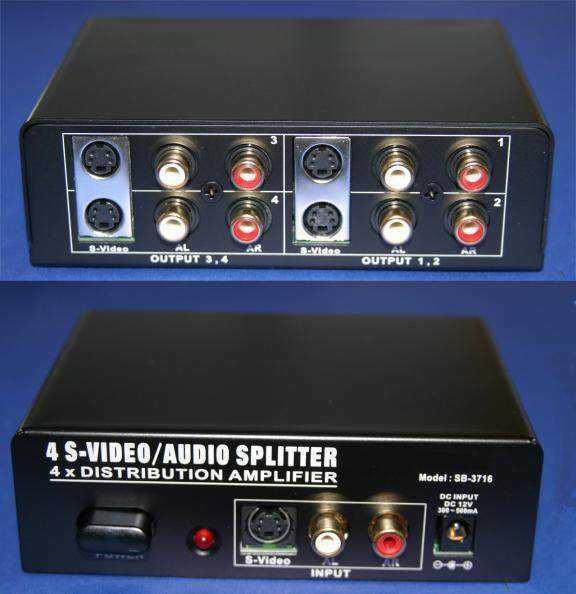 These Audio/Video Splitters prevent picture degradation by actively driving each output with an amplifier, making this the ideal solution when running S-Video cable over distances greater than 10 feet, or when connecting multiple monitors. The same image is displayed on all outputs, with no degradation of signal. Compatible with NTSC / PAL S-Video and stereo audio. > 10 MHz video bandwidth. Input devices: DVD, VCR, satellite or cable receiver, video game system, security cameras. Output Devices: TV, VCR, monitor, projector, stereo speakers. Type of Video: S-Video (Y/C). Video Input: 0.3Vpp, 75 ohm. One S-Video 4 pin female Mini DIN connector. One pair of RCA audio jacks (R&L). 4 S-Video 4 pin female Mini DIN connectors. 4 pairs of RCA audio jacks (right &left speakers). Distortion: Video: < 1.2dB. Audio: < 0.6dB. Signal to Noise Ratio: < 50dB. Audio / S-Video Distribution Amplifier. 6-foot S-Video 4 pin Mini DIN cable.